Check out my review of a CiPU Backpack Diaper Bag HERE! 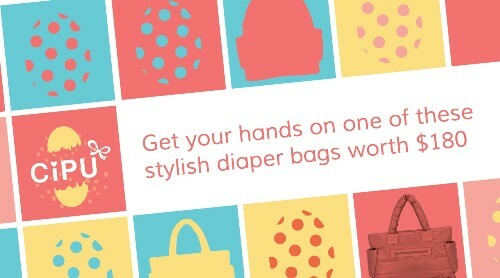 Then go HERE to enter to win the Exclusive Easter Diaper Bag Giveaway! Decorated with clean designs, fashionable and trendy, you can now carry all your baby essentials in charming style with a CiPU Diaper Bag. Packed full of essential features such as top-zip opening, spacious main compartment, multiple storage pockets and includes your very own personal belongings pouch, for phones, purse and more. CiPU's diaper bags have the style and quality every mom deserves, plus features that ensure they meet your baby's needs.